We all know the holiday season is an opportunity to spend well-deserved time with the family. 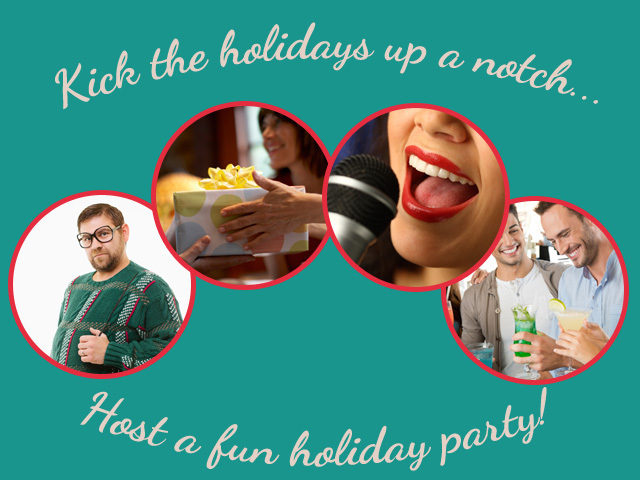 However, why not kick it up a notch and host a fun holiday party everyone can enjoy! In honor of our Holiday Survival Tips, we want your party to stand out among the rest. Add some of your own inspiration to these top 5 holiday parties. There’s no hiding it. We all have that ugly sweater given by Aunt Shirley, which we immediately stashed in the attic. Well…wear it proudly at your Ugly Sweater Party—where the photos are priceless and everyone has a good laugh. This is gag-gift giving at its finest. Instead of spending the time and effort to shop for friends, acquaintances, or employees, why not host a white elephant party where you can give the best present of them all: laughter and memorable moments. If you are unsure how to throw a white elephant party, check out this website. Have you been caught humming to the holiday classics? Open up those vocal chords with friends and family by hosting a Caroling Party. Meander to a karaoke bar or buy a home karaoke set, and belt out your holiday spirit—laughter with friends and family guaranteed! Whether you love the fruity drinks or prefer a hard cider, we all have different tastes in cocktails. Why not take our taste buds to a whole new level by hosting a Cocktail Party? Ask your guests to bring their favorite cocktail recipes and let the merry times begin! Who doesn’t love a holiday classic? A Holiday Movie Marathon is an excellent way to gather your friends and families and share laughs and memories together. Tip: Be sure to keep your repertoire less than 5 movies to keep your party merry. If you need a list of movies, read this article for 10 holiday classics. Start planning your party and add your own flair to make it truly memorable! Share with our North Oaks dentists: What holiday parties are you throwing?